Revolutionary War was an eight-issue series that bought back Marvel UK’s classic characters to the modern day Marvel Universe. 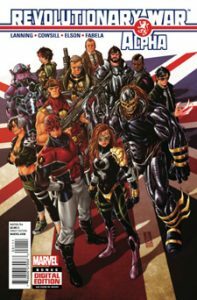 Featuring Death’s Head, Captain Britain, Warheads, Motormouth and Dark Angel it updated these heroes for a new generation. I co-wrote four issues of the series (Revolutionary War Alpha, Death’s Head II, Warheads and Revolutionary War Omega) with Andy Lanning while Rob Williams worked on Super Soldiers and Knights of Pendragon, Kieron Gillen on Dark Angel and Glenn Dakin on Motormouth. One of my earliest jobs was an assistant editor on many of Marvel UK’s American titles back in the 1990s, so plotting and writing the return of these heroes was a dream come true. Hopefully it’s not the last the world’s seen of them.